WE WANT YOUR TIME WITH YOUR PUPPY TO BE AS CAREFREE AS POSSIBLE. IN ORDER TO TRY TO PREVENT STRESS DIARRHEA UPON TRANSITION TO A NEW ENVIRONMENT, WE AGGRESSIVELY WORM YOUR PUP BEFORE IT GOES TO ITS NEW HOME. WE TRY TO DO ALL WE CAN TO PREVENT PROBLEMS.. YOUR PUPPY WILL BE ​up to date on vaccinations. PUPPIES WILL BE GIVEN A PARVO-ONLY VACCINE AT five WEEKS OF AGE BECAUSE PARVO CAN STRIKE EARLY, AND IS DEADLY.. THEN two WEEKS LATER, AT APPROXIMATELY At seven weeks OLD, THEY'LL RECEIVE their 5-WAY PUPPY VACCINE. WE WILL PROVIDE YOU WITH AN UP-TO-DATE HEALTH RECORD FOR YOUR PUPPY, AND THE ACTUAL DATE/AGE OF ANY VACCINATIONS WILL BE NOTED ACCORDINGLY. YOUR PUPPY WILL HAVE A two COMPLETE EXAMINATIONs PERFORMED BY OUR VET WHEN HE/SHE IS APPROXIMATELY six & eight WEEKS OF AGE.. WE WILL PROVIDE YOU WITH AN UP-TO-DATE HEALTH RECORD FOR YOUR PUPPY, AND THE DATE/RESULTS/VET INITIALS WILL BE NOTED. WE WILL ALSO PROVIDE YOU WITH OUR VET'S CONTACT INFO. IF YOU HAVE ANY QUESTIONS/CONCERNS. We microchip all pups before they go to their homes. We want for you to keep your microchip information up to date on your dog. For this reason, we use a microchip company that doesn’t charge you for any corrections and updates to your database called Microchip 4 solutions Inc. (M4S ID) 1/3 of all dogs get lost in their lifetime. 30% of lost dogs are never found. Many of those dogs end up being euthanized in shelters. Dogs with microchips have a 97-100% recovery rate. We love our dogs and do our best up front to ensure if lost you will be reunited with them! M4S ID provides a uniquely numbered stainless steel lifetime collar tag for you. This includes their phone number, so if someone finds your dog & calls that number, they can tell them exactly who he/she belongs to. Also, the microchips we use are international, so if you travel abroad with your puppy, they don't need an additional microchip. We take pride in only breeding English Cream Golden Retrievers who have been "Hip certified." By doing so,, we drastically reduce the chances of your companion suffering from hip dysplasia. Hip Dysplasia is an arthritis-like disease which affects about half of golden retrievers. It typically develops between the ages of 2 and 5, and it causes intense pain while walking. The only cure is to surgically replace the hip, which is expensive and often results in reduced mobility. The good news is, it's mostly genetic. So by only breeding hip certified dogs, we are able to reduce the incidence of hip dysplasia, and your companion will likely never develop hip dysplasia. There are two different tests (both based on X-rays of the hip) available for hip dysplasia in the U.s.. One is through Orthopedic Foundation for Animals (OFA) where they describe canine hip joints in 7 categories (Excellent, Good, Fair, Borderline, Mild, Moderate, or Severe). And the other test is through PennHIP. They take an exact measurement of how tight/loose the joint is. And based on that number we can determine if we should breed. Life’s Abundance is the best dog food we have ever found. It is made with premium-grade ingredients. They don’t put additives & preservatives in their dog food. Life’s abundance is calorie dense, so a bag lasts a long time. In addition, because they only need to eat a little, there is much less stool to pick up. Life’s Abundance is on the cutting edge of nutrition research. They have high-quality proteins, vitamins and minerals, antioxidants from fruits and vegetables, omega-3 fatty acids, flax meal, brewer’s yeast, and direct-fed microbials (probiotics). Microbials help with absorption and can promote intestinal health and a strong immune system. 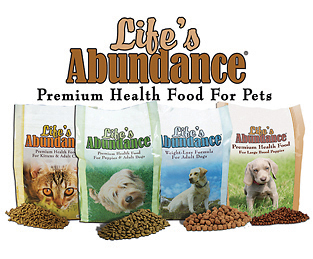 We feed all our Companions "Life's Abundance All Stages Dog Food" from puppies to adults! "​Karbo Essentials" is a special formulation for young puppies & dogs. It helps alleviate the dangerous symptoms of diarrhea and dehydration in newborns caused by pathogenic bacteria, viruses, protozoa, fungi, environmental stress, and especially disease parasites such as worms, coccidia, and giardia. Karbo Essentials also has a profound effect on the immune system - it increases immune system response - therefore a healthier animal. We start feeding Karbo Essentials Powder to our puppies as soon as they start eating solids! We give NuVet Plus® daily supplements to all of our dogs. It is a high quality product that incorporates a precise formula of vitamins, minerals, enzymes, herbs and antioxidants that perform synergistically to bring together all the vital ingredients required to improve your pet’s health and keep them healthy. NuVet Plus® is made using only 100% All-Natural, Human-Grade ingredients that are formulated in a FDA-Approved Pharmaceutical Laboratory. Ingredients are compounded to maintain their integrity and bio-digestibility for complete cellular infusion. we start feeding NuVet Plus® to our puppies at about 6 weeks of age! Female dogs secrete special pheromones while nursing their offspring called “dog appeasing pheromones" or "D.A.P.” They act to comfort and reassure puppies in times of stress. 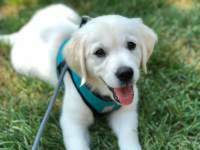 We spray Adaptil DAP on a ribbon for your puppy to wear for awhile before he/she goes to his/her forever home to decrease your puppy’s stress response to leaving his/her mother & traveling.. If your puppy is being driven or flown to you, we spray Adaptil DAP in your puppy’s crate in order to decrease your puppy’s stress response to leaving his/her mother & traveling.